KING KONG AND BE MINE! *Download this book at drjean.org/February, 2007. Come to think of it, conversation hearts were the beginning of text talk. 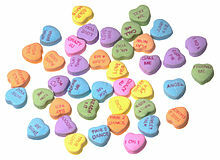 According to a little research on the web, “Sweetheart” candies have been around since 1901. In the past decade the sayings have been updated with phrases such as “Fax Me” and “LOL.” Although over 100 years old, it’s good to see these little candies alive and well. Here are some adaptations for using them as a springboard for learning. *Download this book to go with the song at drjean.org/February, 2007. Note: If you are at a school that doesn’t observe holidays, you can easily adapt all of these ideas. A letter is on its way. Along came child’s name with a penny one day. (I used puff fabric paint to make my sprinkles. After a long day and flight I saw this Big Blue Bear when I got to my hotel in Denver. He made me smile! How whimsical and adorable!! Some talented person with a child-like heart created this to remind all of us that life is big and joyful and full of surprises! Here's something that is inexpensive and requires little prep time. Newspapers and magazines can be used in multiple ways to expose children to print. *Let children use a highlighter to find letters, the letters in their names, sight words, punctuation, and sentences they can read. * Cut out words, letters, etc. *Use Wikki Sticks in a similar way to find letters, words, and punctuation in "real" books. Bring the top flap down to the crease. Bring the back flap down to the crease. Put thumb in one opening and index and tall fingers in the other opening. 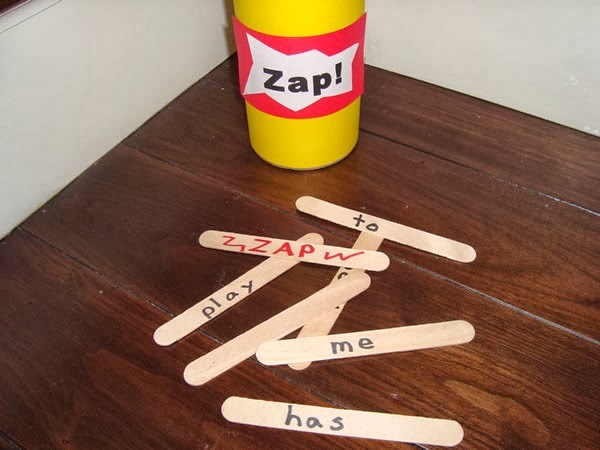 This makes a puppet kids can open and close to demonstrate syllables in words. * Let children decorate with construction paper to make a dragon, monster, etc. Divide the class into two teams. The first student on each team is given a fly swatter. Place numerous graphics/pictures on the board. The teams line up in front of the board and the teacher calls out a letter. The first student to hit the picture starting with that sound earns a point for their team. *Adapt for numbers, math facts, words, etc. On bad weather days write sight words, letters, vocabulary, etc. on sticky notes and scatter around the school. Go on a "silent" scavenger hunt and find post it notes. 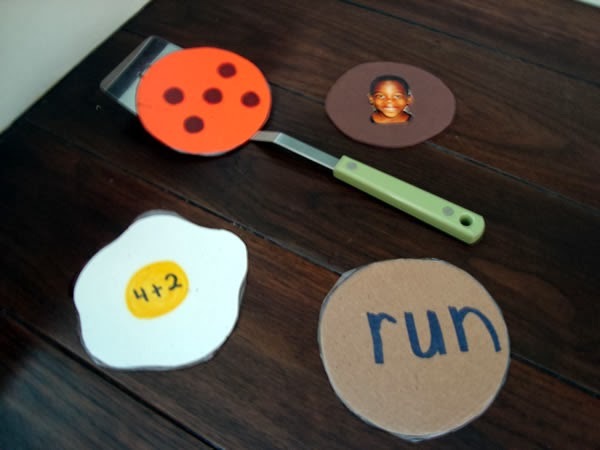 Use plastic eggs to make a letter/sound matching game. Tape clip art on one half of the egg and write letters with a Sharpie on the other half. *Use the same color for a visual hint. LOL - Thought you'd get a kick out of the Duck Dynasty! This is a great visual for the song "Bingo."' Cut out a large dog bone and write Bingo on it. Cut out 5 hands and write the numerals 1-5 on them. Put Velcro on the back. Attach the hands to the bone as you sing so the children will know when it's time to clap. Children stand in a circle. As they count each child says a number. The child who says the predetermined number must sit down and the counting starts again. The last child standing is the winner. *Choose a number between 1 and 20 or the game is too long. I am humbled by the wonderful teachers I meet everywhere I go. You inspire me! Thank you! It's bright and early and before I head to the airport to fly to Wichita I must apologize for my error yesterday about the Super Bowl. Duh?? I thought Denver was playing New England. It's Seattle that Denver will be playing this Sunday. Same activities...different team! Shows you how much I know about the NFL!!! Have a great week! Several years ago my friend and I were discussing new ideas and I said, “Do you think we’ll ever get tired of this?” Her response was, “If we ever get tired of this, we need to quit.” Well, I’m certainly not ready to quit because I keep getting amazing ideas like these from teachers I meet every week. Prepare envelopes by drawing sets on one side. Put these in a bag and make a mail carrier hat. Make houses from file folders and write numbers on these. Put the houses on a cupboard or wall around the room. The mail carrier gets to deliver the envelopes to the correct house. *Use this same activity for matching math facts, pictures and sounds, etc. 3rd Grade - sign for "I love you"
Margaret learned this chant from Harry's Kindergarten on YouTube. Use a green dot to indicate where to start when tracing a letter. Use a checkered flag or red dot to indicate where to stop. Children drive toy cars from the start to stop. If you want to write a letter start at the top. Yes, it's the top, top, top! Remember to start it at the top. What are Denver’s team colors? What are New England’s team colors? I like open-ended materials and activities where ALL children can be successful. Take a look at some of these ideas with the thought of how you can “bridge” hands-on and developmentally appropriate with Common Core Standards. 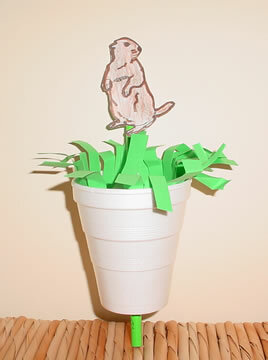 Junk Box – (paper scraps or recycled materials such as TP rolls, bottle lids, plastic containers) Children can demonstrate what they’ve learned by creating a sculpture, character, 3-D shape, invention. It’s all about balance! Yes, technology offers many opportunities for individualized instruction and competence, but it needs to be balanced with social interactions and hands-on activities. I’m just saying…. The funny thing is if you read my blog I’m preaching to the choir and you are probably doing all of these things. Never, ever, ever give up!!! Someone once told me that a good consultant/teacher needed to give you something for your hands, something for your heart, and something for your brain. Hands – I try to give you lots of hands-on and practical activities you can use daily in your classroom. Heart – Sometimes I have a little encouragement or inspirational story for your heart. Brain – And, occasionally, I share a book I’ve read, research, or pertinent information for your brain. Today I have something for you to ponder! Erik Erikson's theory of psychosocial development was one that I studied in college (yes, years ago), but it has relevance for teachers today. A principle of Erikson’s theory was the development of personality and ego through social interaction. Erikson believed that at each stage there was an area where the person had to develop a sense of “mastery” or ego strength. His 4th psychosocial state ranged from age 5-11 and was known as INDUSTRY vs. INFERIORITY. During this period children develop a sense of pride in their accomplishments and abilities that will influence the rest of their lives. Erikson emphasized the importance of social interactions, and what better way to do that than working with a partner or assigning group projects. Do you see the difference between having children play a board game with a small group and playing a solitary computer game? Do you see the value in asking children to construct a book and keep a weather journal? Do you see how engaging creating puppets out of lunch bags and using them to retell stories can be? And that’s why I was so thrilled to learn that the 3rd graders in K.J.’s school are learning to square dance!! Children have a lifetime to be an adult and sit in front of a screen. They only have ONE chance to be four, or five, or seven! I am committed to children and have a deep respect for “ages and stages.” It’s a missed opportunity if we don’t give children the time, materials, and projects they NEED to develop this “mastery” and pride in their accomplishments. Come back tomorrow and I’ll share some specifics for your classroom! *You can download the book at drjean.org/ February, 2007.
the groundhog as appropriate in the song. "ON” to Wisconsin last Thursday where I learned a GREAT technique for making flannel board activities. As long as I’ve been teaching, it’s refreshing to learn something NEW! Buy milk filters at a farm supply store and cut into 8 ½” x 11” rectangles. These can be run through a copy machine to make story characters, math manipulatives, shapes, etc. The filters are easy to cut and store. Children can also make their own flannel board pieces by coloring on the filters with markers or colored pencils. 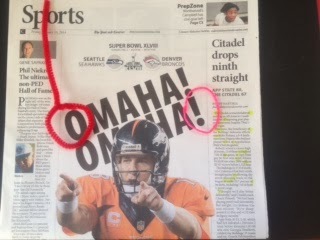 After laminating highway letters and numbers, put shaving cream on the dotted lines. Children can “drive cars through the snow” for multi-sensory fun! Use number magnets or other visuals to show how many days children have been in school as you sing. 82 days of school on the wall, 82 days of school. It will be 83 days of school on the wall. Here’s a new way to transition from one learning center to another. Ready – Children put their work into their folder and get ready to move to a new center. Set – Set the table for the next group. Switcheroo – Move/switch to the new center. Hot glue pre-writing forms on file folders for children to trace. *Use mini-golf pencils for better control. Ask to have notebooks cut in half. They will be small enough to keep in children’s toolboxes for daily journals at the end of the day. Children can use a book made with 2 sheets of paper folded in half to help them learn the days of the week. Write the name of the day at the top and have children draw what they did. They can review the whole week at the end. If you add another page they can fill it in over the weekend at home. More “souvenirs” from my travels last week! When counting to 100, do a different activity/motion for each set of ten. Children start by coloring slowly with one color. As the song gets faster they change colors and color faster. *Use the instrumental version of the song on Better Bodies and Brains. Write words, letters, numbers, etc. 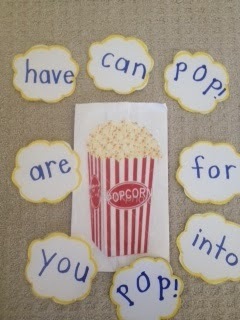 on die cut popcorn pieces and place in a plastic popcorn container. Children take turns pulling out popcorn. If they know it they keep it - if not they put it back in the container. *Write “POP” on some pieces. If a child picks “POP” they have to put all their pieces back. Write letters, words, numbers, etc. on Jenga pieces. 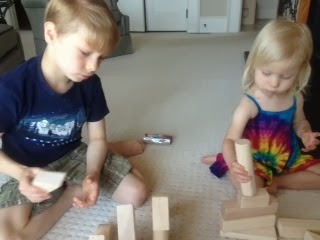 Children take turns pulling a block. If the child knows the information they may put it on their own tower. If the child doesn’t know, then it goes back in the bucket. *They can play with a partner or small group. Make a poster and glue on large envelopes cut in half. (The envelopes need to be large enough to hold a CD. Cut them so the CD is sticking out.) Put a list of the songs on the outside of each pocket and highlight the songs you use the most. *Great for subs because you can say “pocket 9, song #4). Cut bears out of construction paper. 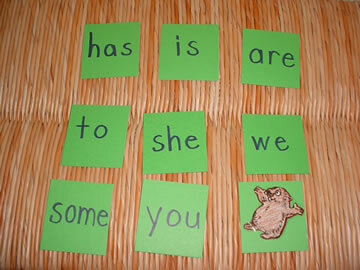 Write letters on the bears and use for letter recognition or as a transition activity to line children up. Use a flashlight pen or laser to point/shine on words as you read them. *Use googlie eye rings, mini wands (Michael’s) or fake fingers with nails to point to words. Last week when I presented in Atlanta I had nostalgic thoughts as I visited the city where I lived for 50 years. I remember the sign on Peachtree Street that posted Atlanta’s population. How thrilled we were in 1958 when it reached one million!! Atlanta now has over SIX million! That’s what I call growth! The amazing thing is that whether you live in a city with millions or a small town of 100, teachers everywhere are they same. They want their children to feel loved and they want to make learning FUN! just know that you’re singing with me everyday! Did you know that you could purchase carpet squares from the dollar store and use like a flannel board? Tape construction paper stars under the table. Turn the lights off and let the children light stars and read the words. I’ve ordered this book by Julia Cook and I can’t wait to read it because it teaches children when it is appropriate to tell the teacher and what happens when you cry wolf. 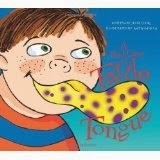 I’m going to do a blog about the book and tattling as soon as it comes in the mail. never know how far a little kindness can go. Link your iTunes with activities on the smart board with this tip. Number the tunes and then let children use a spinner to click on the song that matches their spin. *Let children roll dice to choose a song. Sometimes children get a little over zealous if you are playing team games where you keep points. Here’s a tip to eliminate some of that competitiveness. Take a deli lid and trace around it twice on paper and cut out. Write “high” on one circle and “low” on the other circle and tape to opposite sides of the lid. (I had to trim the circles a little to get them to fit on the lid.) After playing the game, toss the lid. If it lands on “high” the team with the highest score wins. If it lands on “low” the team with the lowest score wins. Note! Do you see how easy it is to adapt these games for whatever age or skill you are working with? Pre-k teachers could use shapes and letters, while second grade teachers could use vocabulary words, math facts, or science questions. Skills: review questions, math facts, words, etc. Directions: Divide the class into two teams. One team is “X” and one team is “O.” One child at a time from each team comes forward. The teacher asks players to answer a question, identify a word, etc. The first player to get the correct answer gets to make an “X” or an “O” on the board for their team. The first team to get three in a row wins. Skills: math facts, words, names, review questions, etc. Directions: Give each child a scrap sheet of paper and invite them to write their name, a letter, word, numeral, question, math fact, etc. on the paper. Divide the class into two teams and have them stand on opposite sides of the room. Children wad up their papers to make snowballs. When the teacher says, “Let it snow!” the children begin throwing their snowballs at the opposing team. Children must open a snowball and identify the information on it before throwing it back at the other side. After several minutes the teacher says, “Freeze.” Children gather up the snowballs, count, and compare. In this game, the least amount is the winner. Continue playing and tallying scores. *A variation of this would be for the teacher to make the snowballs ahead of time by writing words, math facts, etc. on scrap paper. The children wad them up and then begin throwing. There are no teams, but the children just pick up snowballs, open them, identify the information, and then wad it up and throw it again. Skills: numerals, letters, words, etc. Directions: Write numerals (letters, words, etc.) on the board. Divide the class into two teams. One child from each team comes forward and is given a fly swatter. The teacher calls out a math fact. The first student to “swat” or hit the numeral that is the answer gets a point for their team. The game continues as children from each team come forward to “swat” the answer. * STOMP is a similar game played with flashcards. Divide the class into two teams facing each other. Place the flashcards on the floor in between the two teams. Choose one child from each team to play. Call out a math problem. The first child to stomp on the answer wins a point for their team. Skills: spelling words, math facts, high frequency words, etc. Directions: Children sit in a circle. One child (it) stands behind the first child in the circle. The teacher holds up a flashcard. If the child standing identifies the information first, he can move “around the world” and stand behind the second person in the circle. If the child sitting says it first, then they switch places with “it” and stand behind the second child. The game continues as the teacher holds up flashcards. The object is to see who can go all “around the world” or the circle. Skills: nursery rhymes, book titles, science categories, etc. following day. Never drag out a game, but “quit while you are ahead” so they will want to play it again. In addition to reinforcing skills, these games will also develop the executive function (self-regulation) and 21st Century Skills (cooperation, collaboration, critical thinking). FYI – When making flashcards, teachers generally use rectangles or squares. The corners on these shapes tend to pull the eyes to the edges. If you make flashcards on circles, then the eyes focus to the figure in the middle. Hint! 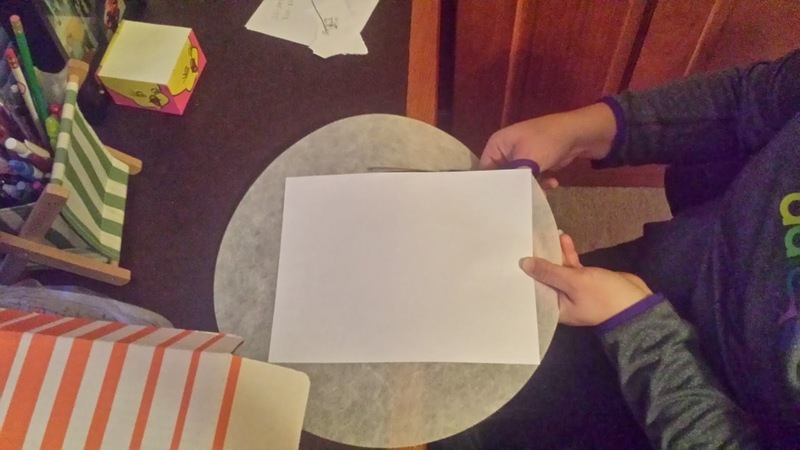 Paper plates are cheap, durable, and perfect for flashcards. Skills: shapes, letters, sight words, numerals, vocabulary, etc. Hint! Shorten the game by having “it” call out two shapes at a time. If there is no one in the corner, ask “it” to call out another shape. Directions: Divide the class into two teams and have them stand on opposite sides of the room facing each other. Give each player a flashcard to hold in front of them. The teacher goes to one team and asks, “Who do you want to call over?” The children select someone from the opposite side and say, “Red rover, red rover, send word right over.” The child holding that word walks, hops, tiptoes, or jumps to the opposite side. The game continues as sides take turns calling words over. I used to love to make and play games in my classroom. I would often tell my children, “If you work hard in reading group, then we’ll have time to play a game at the end.” What they didn’t realize was that the game usually reinforced a skill we were working on. 1. Limit games to one concept of skill. 5. Construct self-contained games for easy clean-up. Store pieces in zip baggies, clasp envelopes, pencil boxes, or plastic tubs. 6. Try to create games that are self-checking for immediate feedback. 7. Make games where all children are winners. 8. 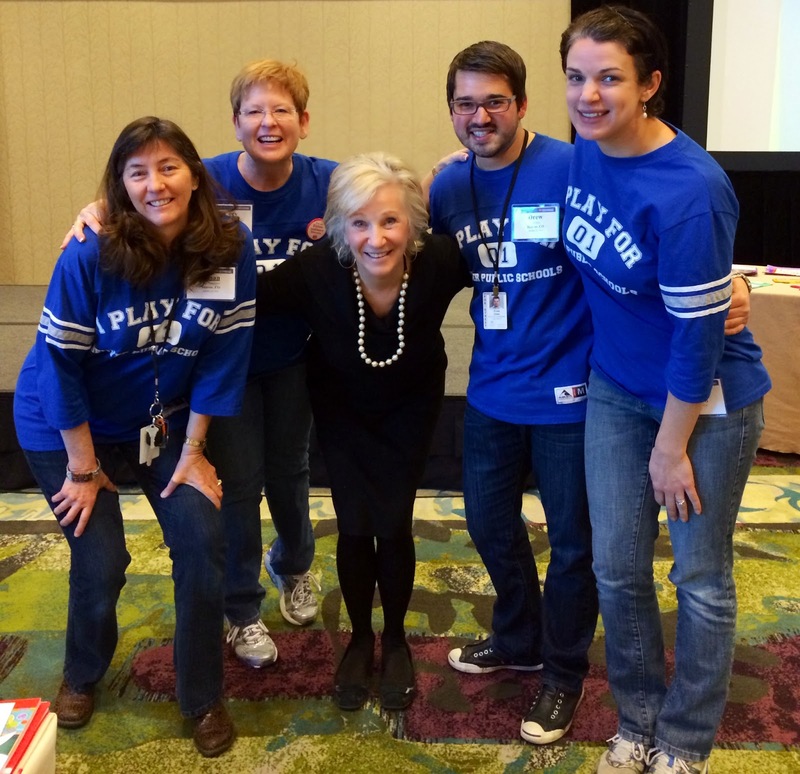 Demonstrate how to use games before you put them out. Model how to clean up and store pieces. 9. Use games in learning centers, with small groups, or when you have a few extra minutes in your day. 10. Let children check out games to take home and play with their parents or siblings. These are a few of my “favorite games” that I have played with children over the years. Adapt them, change them, and, above all, have FUN with them! SKILLS: letters; sounds; math facts; contractions; antonyms, etc. DIRECTIONS: Cut 3 ½” circles out of poster board. Write uppercase letters on one side and lowercase letters on the other. Place the circles on the floor or a table. Children name the letter on one side, and then flip it over to self-check. Hint! Craft foam and corrugated cardboard also make good flippers. More! 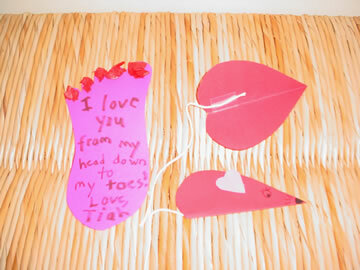 Write words on one side and glue matching pictures on the back. 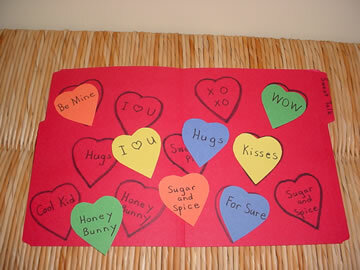 Write children’s names on one side and glue their picture on back. 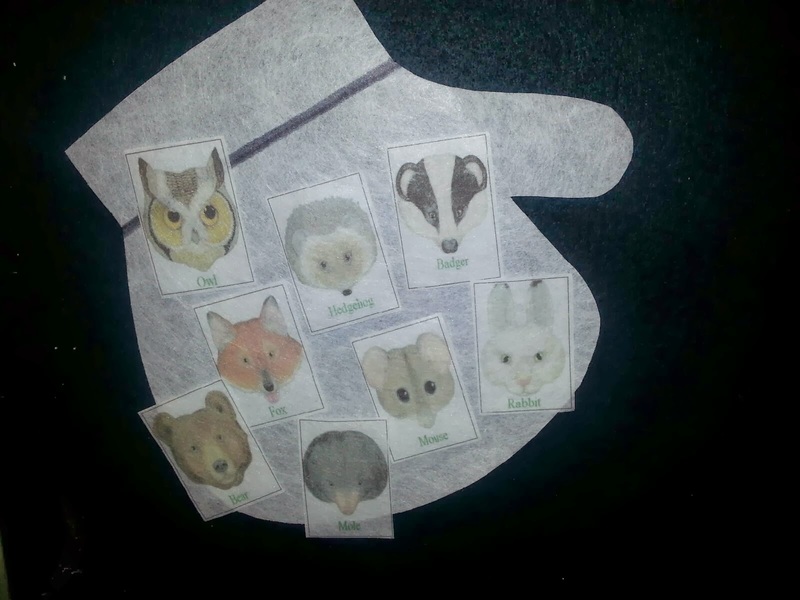 Put pictures on one side and initial consonants or vowels on back. Write antonyms on opposite sides. Write two words on the front and the contraction on the back. DIRECTIONS: Cut puppies out of construction similar to the one shown. Cut pictures of familiar objects from workbooks. Glue a picture on the puppy’s tummy and the corresponding initial letter under the ear. Children identify the sound and then check by lifting the ear. More! Use this pattern for matching upper and lowercase letters, words and pictures, math facts, etc. *Does anybody play this game any more? My class used to LOVE it! Bet yours will as well! 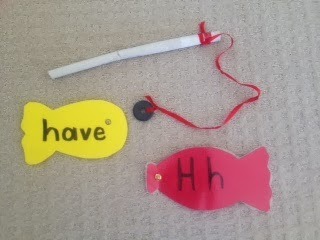 DIRECTIONS: Cut out fish from the construction paper similar to the ones shown. Write a letter or word on each fish. Attach a paper clip or brad fastener to each fish. Tie a magnet to the end of a 20” piece of string. Tie the other end of the string to the stick to make a fishing pole. Children spread the fish on the floor, and then try to catch a fish with the magnet on the end of the pole. If they can identify the information on the fish, they may keep it. SKILLS letters; words; phrase cards; math facts; shapes, etc. DIRECTIONS Cover the can with construction paper and write ZAP! on it as shown. sticks to the can. Continue passing the can until there is one person left. game for different holidays or units of study. For example, in October you could use skeleton stickers and the children could “shake their bones.” In January glue a snowman and they have to shiver. Creative games for little minds. Games are a perfect vehicle for reinforcing reading and math skills, and they nurture social skills, motor skills, and the executive function. Motivation and repetition are natural when children enjoy a game. *You won’t believe all the great free downloads on this site! One of K.J. 's favorite activities in first grade was designing his own game. The teacher gave them a blank game pattern that they glued to a file folder. The children got to make up rules, penalties, markers, etc. That's a powerful opportunity for a kid! Wouldn't it also be a fun activity with a partner or small group? How about asking parents to donate used or new games? Adapt the games for skills and standards. For example, one teacher said she took 4 old Candy Land games and wrote letters on the cards and board at the beginning of the year, then numerals, words, and math facts. Children never want to do a worksheet again, but a game is a “sneaky” way to get them to repeat key skills. Explain to your class that you have some “secret signals” for the New Year. Don’t tell anyone else because they are just for your class. One - The children sit down. Two – Children put hands in their laps. Three – Children smile at you. Practice the first three signals, and then you can add more. Four – Children line up at the door. Five – Hands by sides. 1 Finger– I need to use the restroom. 2 Fingers – I need a tissue. 3 Fingers – I need my pencil sharpened. 4 Fingers - I need water. 5 Fingers – I know the answer or have a question. *Make a poster to help children remember the signals. When the teacher says, “Give me cheer number one,” the students cheer loud and wave their arms. When the teacher says, “Give me cheer number two,” the students cheer a little softer. When the teacher says, “Give me cheer number three,” the students wave their arms, open their mouths, and don’t make a sound. Hush little children don’t say a word. We’re leaving the room and shouldn’t be heard. Hands at your side and do not talk. Tip toe in the halls when we start to walk. TIPS AND TRICKS FOR THE NEW YEAR! LITTLE THINGS COUNT - to 100! HAPPY HANDSHAKES FOR A HAPPY NEW YEAR!